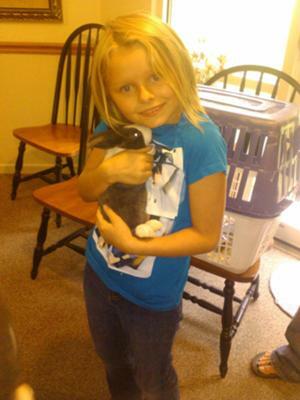 We gave our daughter a dutch rabbit for her 10th birthday. Coccoa as she has been named by our daughter has been a true delight. She is very quiet and personable. She hops around on the floor, she is very curious and we have to watch that she doesn't get close to any electrical wires as she will chew on them. Our daughter bought a harness and leash for Coccoa to take outside for walks. Coccoa does not walk on the leash but it is a way to make sure she doesn't scamper off, which she has tried on occasion. Her favorite setting is you sitting in an upright position and her scampering on the ground around you in circles. She stops to lick you and continues to hop on.